PLAY AT YOUR OWN RISK At the end of the 1800s the government declared a global ban on this legendary card game due to an increase in bar fights, divorces, and family feuds. It was political correctness gone mad. Awkward is the ultimate test on finding out how well friends, couples, and family know each other. Players are asked to answer increasingly uncomfortable questions in secret, while their companions try to guess the outcome. HEATED CLASSICS! Pineapple on pizza, yay or nay? RELATIONSHIP CHOICES! What part of your partner do you prefer, body or face? HORRIBLE DILEMMAS! If you could only save the life of one, would you choose a 1-year-old or an 18-year-old? Whether you deduce correctly or incorrectly, games of Awkward help players see each other in a brand new light. And your opinion counts: each Awkward question will let you compare your vote to the rest of the world. Banned for over 120-years, Awkward is back, and you can now enjoy this controversial adult card game as a videogame. QUALITY GAMEPLAY Featuring the original banned questions, as well as all new content written by Danny Gallagher (Quiplash, Fibbage 2) and Joanna Haslam (Buzz! Quiz World, It's Quiz Time). One to six players can join in, with a huge selection of game modes on offer. Play cooperatively, as teams, competitively, or solo players can play alone to guess how the rest of the world fared with Awkward's controversial questions. DESIGNED FOR STREAMING Awkward features innovative streaming technology which lets up to 500,000 concurrent viewers play along in your broadcast on Mixer or YouTube. Thanks to the unique 'Live Show' technology, viewers can participate in the chat, without needing a mobile companion app or having to visit a special website. Your viewers have to guess what you think, and compete to get their names on the top of the leaderboard! 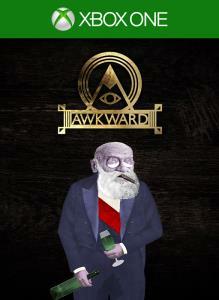 Awkward is the ultimate party game featuring over 5,000 fiendish questions. Do you dare to find out how well you really know each other?